I was watching the movie The Internship (don’t ask), and my big takeaway, even with my fancy degree in film, was this: how the hell did Google get a feature film for an employer branding initiative? I mean, it’s not enough that they’re already the most InDemand employer according to LinkedIn, which obviously means it’s totally true – they’re also the top rated company to work for on almost every such list out there. Then, I had this admittedly nerdy thought: I wonder what ATS Google uses? Then, I went in to the application process to see if a URL might reveal the white labeled SaaS system behind their beautifully branded career site. Nope. Instead, I got a completely differentiated Terms of Service specifically written for job seeker. This was the only instance of a separate TOS hosted on Google itself not actually governed by other user agreements and terms. Which means that Google, as an OFCCP company (they’re a huge federal contractor), has to have a unified system which meets the country-specific privacy and safe harbor standards which govern candidate data more tightly than consumer data. Consumers must have privacy, after all, but candidates are imminently auditable. So Google, by treating candidate data separately, has already created a distinct database that’s got their search as the native way to find jobs (and I’m guessing, candidates on the back end – I’ve never recruited for Google, obviously). They’re doing so for an inordinately complex company operating across markets, languages and product lines. Most of their posted positions are highly specialized and highly competitive. But somehow, they still keep finding enough top talent to stay, well, Google – a place where even movie characters in bad Vince Vaughn vehicles want to work, a motivation so widespread that a studio actually used it as a plausible plot device (albeit with an absurd premise). 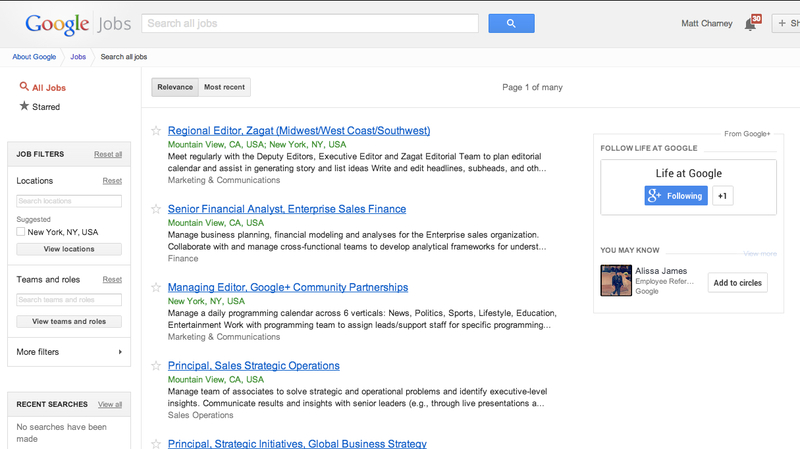 I was surprised by some other things I discovered: namely, that Google gave me the ability to hook up my Google+ profile and find jobs that most match the skills and companies I’ve got listed on my G+ profile. The one that like most people I set up once and haven’t looked at since. But it’s growing fast, and they’ve already picked up a pretty good chunk of the US social media market share, and is already the focal point for most of our digital or personal branding footprints. “Googling Yourself” is used in the common vernacular, and over 90% of recruiters do use search engines to look up candidate’s names. So, that’s an important product point. That they can match open jobs and display results based on social profile information and location – not to mention actually apply for jobs in one click from any device (mobile and cloud being pretty blase for Google) anywhere in the world – means Google’s proprietary ATS already functions better from a candidate (and user) experience than any commercially available competitor. Then I realized that, despite my long held suspicion that Facebook was going to make a big move to render LinkedIn irrelevant and corner the recruiting market, I saw I was wrong. It’s actually going to be Google. And if they made the move tomorrow, it would be game over for pretty much every talent acquisition and management competitor out there. After all, try selling against Google as a point solution or clunky “integrated talent management” suite. Yeah, you’re mobile and social and search friendly – they invented that. Compliance and user privacy? They’re already indexing your company’s e-mail because they run it with your IT department’s implicit sanction. And if the future is big data, try constantly indexing – and storing – a real time record of the entire world’s online activity. So the question for vendors might be: feel lucky? Because I’m not sure, upon inspection, why in the world they haven’t already put the entire ATS ecosystem out of business yet – or even made any public forays into testing the extremely lucrative enterprise HR technology market. But it has to be coming – at least, a boy can dream, can’t he?